I have been thinking about how to share this post for the last few days. I’m always one for honesty, assuming I’m able to be honest with myself. I can’t help but share this story, but I hope you will forgive me for leaving out some of the details. Maggie was born on Sunday afternoon. Tuesday morning Jack had a minor surgery scheduled. 36 hours after Maggie entered the world Jack would take a drive up to Johns Hopkins and go under general anesthetic for an out-patient procedure. He would be home that afternoon. Originally I hoped that both mommy and daddy could be there. When the clinic called to confirm his appointment they informed me that only one parent would be allowed in the room with him before and after surgery. All I could hope for was that Maggie would come early enough before Jack’s surgery that I would be home before he left or she would hold off until after everyone was home. She certainly cut it pretty close. 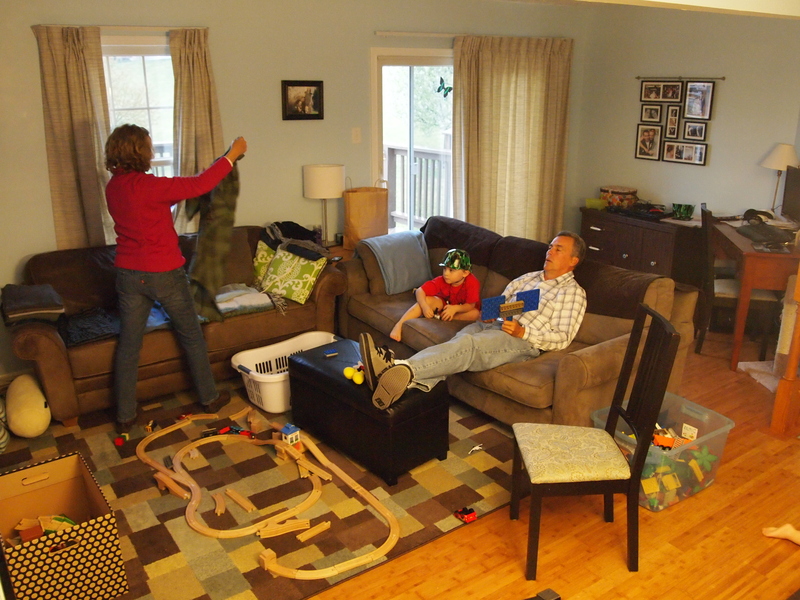 My parents stayed with me, Henry and Maggie while Jack and Daddy went to surgery. With all that help my kids were taken care of, meals were made for me and my house was immaculate. I tried to nap. I couldn’t sleep. A few times when I went to lay down I started to cry. I couldn’t sleep. Everything was happening all at once. I was worried and tired. Finally, Jack got home. He looked tired, but seemed mostly normal. My family was united again. I could finally breathe again. Have you seen the Exorcist? We tried to give Jack some food because he hadn’t eaten anything all morning. Epic fail. My parents had their bags in their hands, they were ready to leave. Luckily they hadn’t actually walked out the door yet. We did 3 loads of laundry that day. Blood. Vomit. Poop (which was just a standard load of cloth diapers) but still. More vomit. Poor Jack. He was having a reaction to the anesthesia. My nerves were feeling fried. I was starting to wonder if this was the onset of a postpartum mood disorder. I know enough to know what to look for in myself, but also not to wait until things get bad before calling my midwives to tell them what’s going on. Everything felt out of control. I couldn’t leave Jack’s side, I felt so bad and was so worried. And during all this. Henry. Poor Henry lost his playmate, to a couch-recovery at the same time he lost his status as sweet snuggly baby of the family. No big buddy to play with. 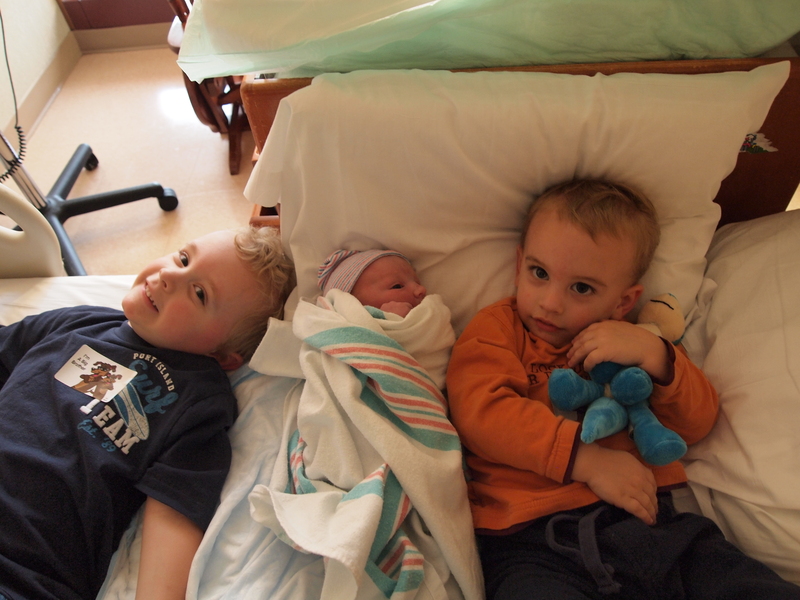 And Mommy and Daddy were constantly holding his new sister. He was not shy letting us know he was NOT COOL with this new arrangement. Not listening. Not helpful. Not interested in snuggling. Which I missed as much as he did. Was this my new life? 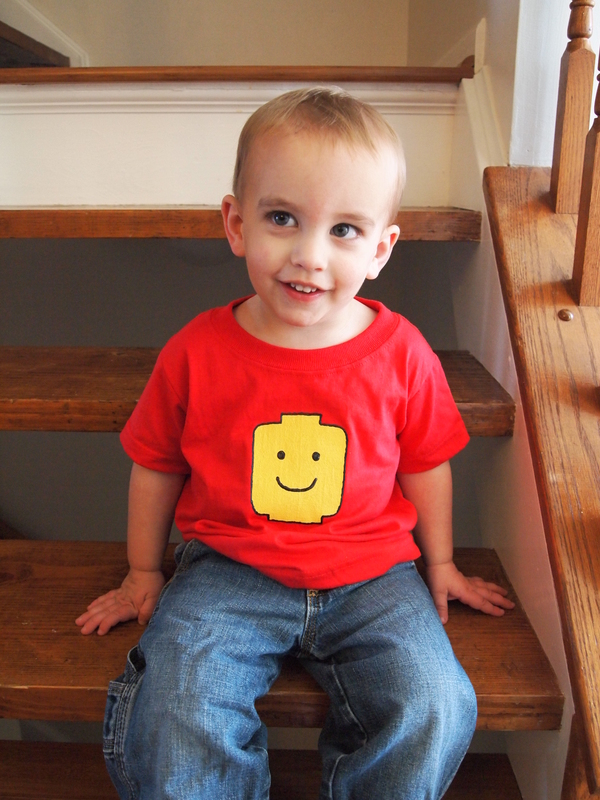 Injured 4 year-old, naughty 2 year-old and oddly calm new baby? Certainly a crash course in how bad things could get all at once. But in 24, 48 and 72 hours life would get easier. I knew that was true. Life would get easier, happier and more comfortable from here. But Maggie will get bigger. Well, I can’t win them all. Now, Maggie is 4 days old and Jack is 48 hours post-op. Things are easier. I feel more at-ease. This could be our new normal. It’s comfortable enough. It only gets better from here. Don’t grow too fast, baby Girl. I need to be sure and savor everything. I suppose I have to decide where this story begins. I had been contracting for weeks. Starting on Thursday 3.22 I was experiencing broken sleep at night because my contractions would wake me up in the middle of the night, I was still 2cm dilated as per my 38 week appointment. Friday was a good day. I drove to a birthday party (an hour away from my house, an hour and a half from my midwives) and I promised the hosts I would wait to go into labor. That night a low pressure system rolled in the rain was tremendous. I woke up in the morning feeling not well rested (again) and crampy. My contractions were consistent, 5 minutes apart and I lost a golf ball sized chunk of my mucous plug. They were the real deal, but they weren’t too hard to breathe through. I decided to call my parents and have them take their time coming up but I had a feeling that later that day or over night would be “time” so having them already here would make that easier. I called my midwives and they said to come to the office and they would just check to see how things were going and confirm labor. I called my doula, Jocelyn, and she agreed to drive me to my appointment so I wouldn’t have to drive myself (I don’t mess with nap time if I can help it). At the appointment that Saturday I learned that I was 4cm dilated and my contractions were tracking on the monitor. 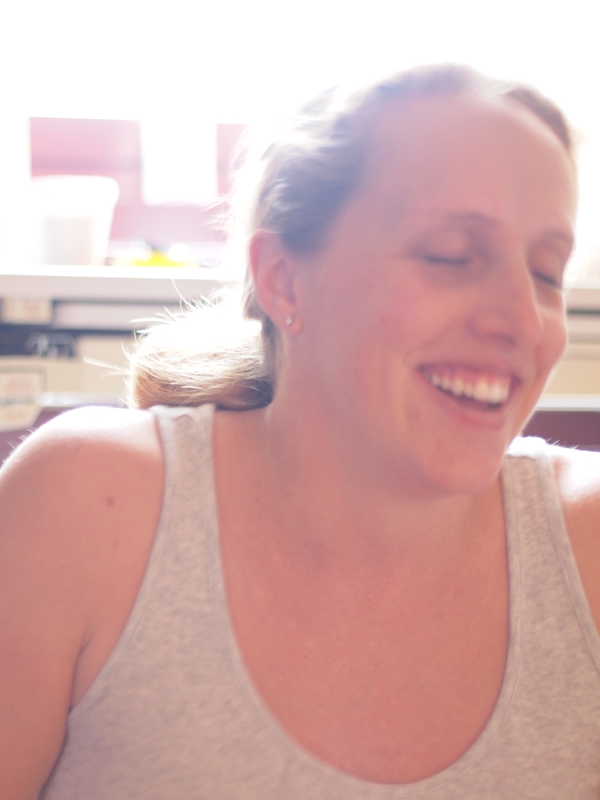 The midwife said “not today, but probably tomorrow.” I agreed and went home. I decided to kill some time by working on Maggie’s blanket. I’m still shocked that I’m not in pain and begging for an epidural. We took one final belly shot, 38 weeks and 2 days. There might have been a bit of controlled chaos, but it didn’t bother me at all. At 2:00am that morning I woke up to contractions 3 minutes apart. 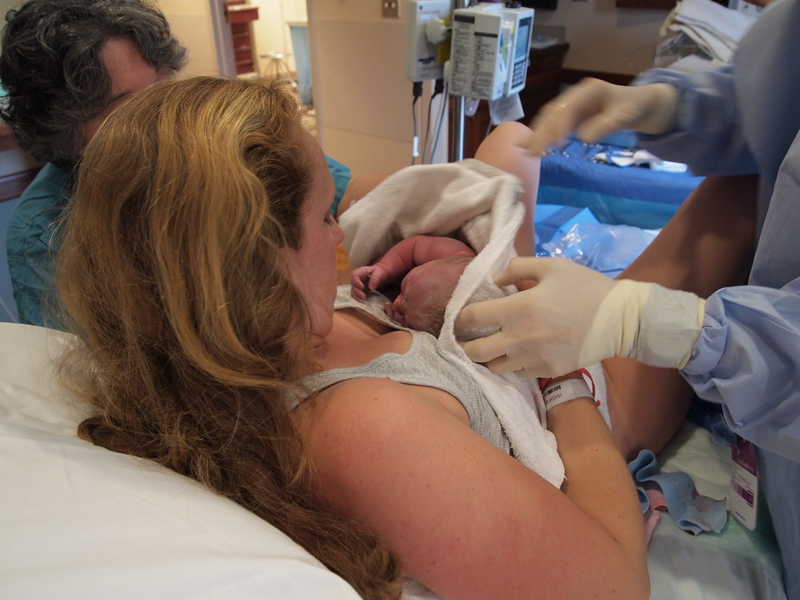 They were certainly stronger and longer than before, and since giving birth in the car wasn’t actually part of my birth plan we decided to call Jocelyn the Doula and the midwives and head to the hospital. When I got there I was 5cm, but the contractions had slowed down again. This seemed to be the way of things this time around. Speed up, slow down, speed up, slow down. So long as I was still feeling okay and able to breathe through the pain I was comfortable with labor moving a little slower. We used a mobile fetal monitor which looks exactly like the first generations of cell phones. It had its own purse to carry the thing in. I made the Husband or Jocelyn the Doula carry it, because that thing just screamed “Cancer Risk” to me. 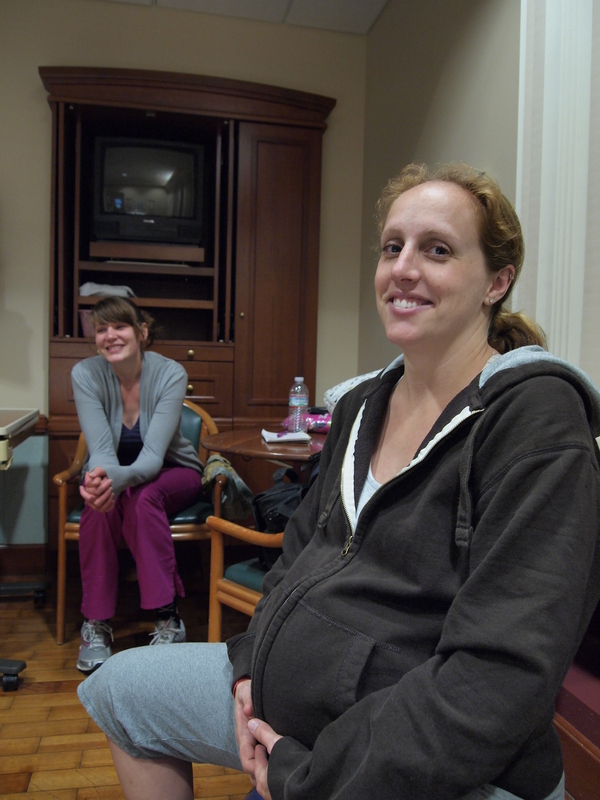 We breathed deeply and remained loose during the contractions. By 7am I was 6cm dilated. Still feeling good, still feeling like a person. Then I had a decision to make: do I let them break my water and hope that helps to encourage things along or do I check out of the hospital and go home and wait for another day. Thinking about my lack of sleep for the several days prior and looking at my husband make his “Please don’t go home and accidentally have this baby in our living room or in my car” face I decided to let them break the water. While I will argue that research concludes that home birth is safe, I don’t feel comfortable gambling the possibility of an unplanned unattended by a professional midwife home birth. I don’t have any equipment needed to birth at home or in the car. Not that you really need much, but a nasal bulb and a towel does not a home birth make. So we shower and walk and squat and pelvic rock from 7am till just about noon. This is what 7cm looks like. At this point my midwife’s supervising physician puts him between a rock and a hard place. The OB doesn’t like that my labor is taking so long. Who cares? I feel fine. Baby looks great. There are plenty of empty L&D rooms on the floor, I keep walking past them- I’m not taking up a bed that someone else ‘needs’. Who cares if this labor lasts another day? I’m totally rocking this labor? But OB’s are limited in their scope of knowledge, they think that using modern medical intervention makes labor safer. There is an obscene amount of medical research indicating otherwise, but who cares about a little thing like data, when signing an order for Pitocin feels sooooo good. My doula and I walk the hall in silence. I keep flashing back to letting them break my water. Wondering if that was the wrong choice. Could that have been the decision that lead to this? Technically I can refuse care. Technically I can leave the hospital. I have rights, I’m not impaired. These medical decisions are mine to make. What have I done? This is my only chance for a med-free birth. I’m not doing this again. Yes, I’m starting to get tired. My bones are starting to ache. I’m starting to wonder how many hours more I have in me before I decide that a long nap with an epidural sounds like a brilliant method for coping with the pain of transition. I agree. Pitocin it is. The smallest dose they can give me. 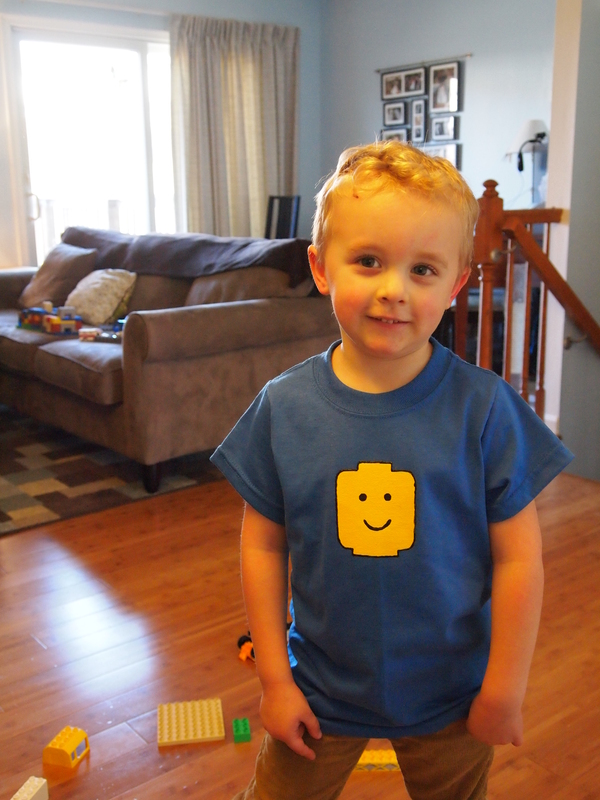 With a scar across my uterus from Jack’s birth pitocin is a risky choice. 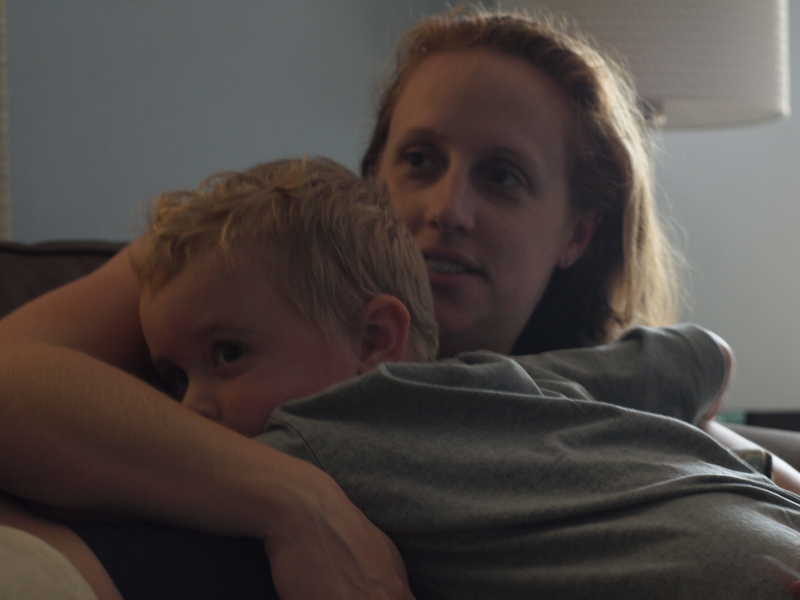 Natural labor is only marginally more risky to a VBAC mom than an unscarred mom. But pitocin isn’t natural, it doesn’t creat the same contractions that my body would on its own. I’m worried about the increased risk of rupture, but I’m more worried about how much pain I’m about to be in because I know what’s coming. I know what 7-10cm is. This is about to be transition. This is what separates the women from the girls (proverbially speaking). I’m not going to wander into transition with a smile on my face. They want me in bed. They are aware of the increased risk of rupture, they want to VERY closely monitor my contractions and her heart rate. Into the bed I go. I occasionally glare at that little bag of saline and the drip drip drip of pain. I lay on my left. Husband and Doula take turns providing counter pressure to my sacrum while I breathe in deep and blow it out. I’m still okay. It’s starting to hurt, but I’m tapping on the side of the bed like a rhythm. Like a drum from the start to the end of each contraction. Because I know that each contraction will end and then I will be okay and I will breathe. For 40 minutes I breathe and tap. Then I feel it coming. I just want to give up. Where is the nice man with the epidural? I can’t do this anymore. Someone get me some drugs. Tears are running down my face and I’m crying. Trying to keep my body loose and my face from tensing up I sob slow deep sobs. I want to tell the Husband and the Doula everything I’m thinking. They need to go get someone to stab that needle into my back. But I can’t even speak. I know if I start to try and talk I’m just going to scream. Then a nurse comes in and tries to tell me that I can’t cry. I’m not allowed to labor with my eyes closed. I’m not allowed to hold on to the rail of the bed and tap. I seriously want to kill this woman. 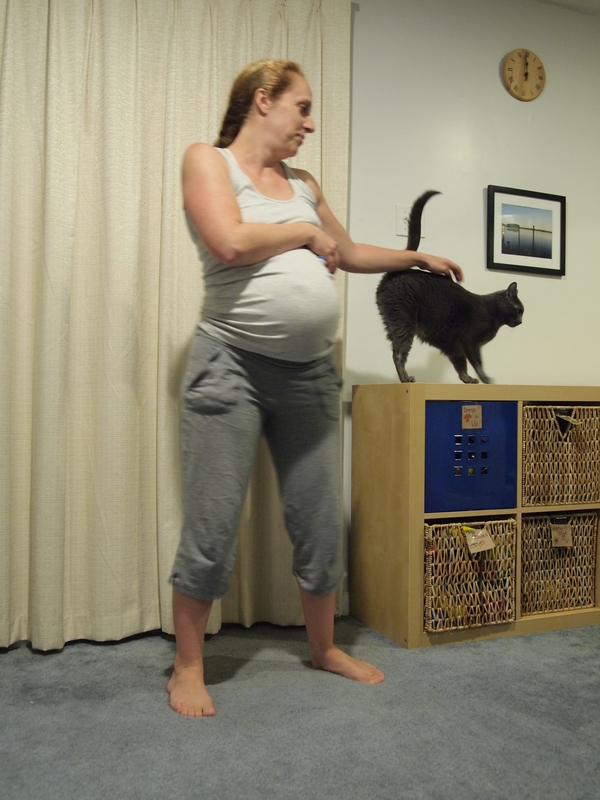 My doula is trying to convince me to change positions. I’m willing but completely unmotivated. This nurse walks in and pushes the button on the bed to force it upright. If I could have walked or moved at all I would have tackled this woman and beaten her to death. She was totally damaging whatever last shread of calm I was holding on to. She pages my midwife. I’m one of those non-compliant patients. David, my David. Deliverer of my Henry comes back in. Looks at me and gets the birth tray. He’s being too optimistic. I’m totally still 7cm. I’m going to have to cave and get the stinking epidural. After all this work too. “You’re a 9.” Okay, 9cm is good but it ain’t no 10. “Okay! Great!” David, we’ve been here before. I pushed for 2.5 hours with Henry. I was happy to do it. I was happy to get to push at all. But you sound a little too excited. This is going to take a while. I don’t think I have a while left in me. “We’re having a baby soon. Get ready.” He’s placating me. I mean blow a little smoke, sure, but you’re…. wait… why are you putting on the delivery gown? “Hey, Emily, lets not have this take too long. These gowns are kinda hot, okay?” He’s making fun of me?! Seriously, what is wrong with people?! The third contraction comes. “Oh no” Is all I can say. “Okay, push! That’s it. Reach down. Feel her head! Breathe in and push again!” Same contraction. Second push. Her head is coming out. Third push. Her head is out. Oh, what the hell…. I breathe in and push just a little and out she comes. Right into my arms. 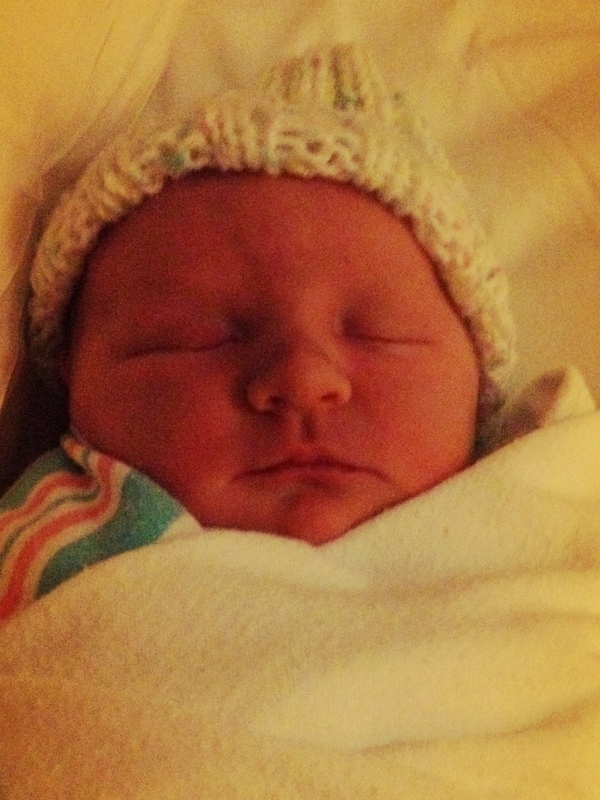 Margaret Ruth joined our family on 3.25.12 at 3:47pm at 38 weeks and 3 days gestation. She weighed in at 7lbs 3.4oz and measured 18 inches long. Tomorrow I will post the birth story and pictures from “the good camera”. For now I will enjoy rest and baby snuggles. I’ve had this theme in my head since I saw that life-changing digital reading: “pregnant”. I knew I was going to do owls. 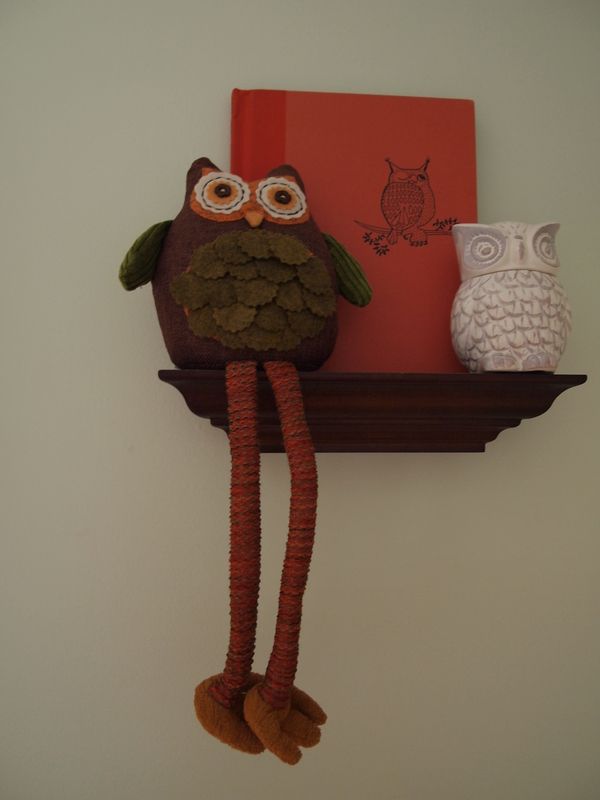 Along with the book, I knew I was going to get (or as it turns out, make) an owl pillow. Have you seen these things on Etsy. So cute I can’t even stand it! 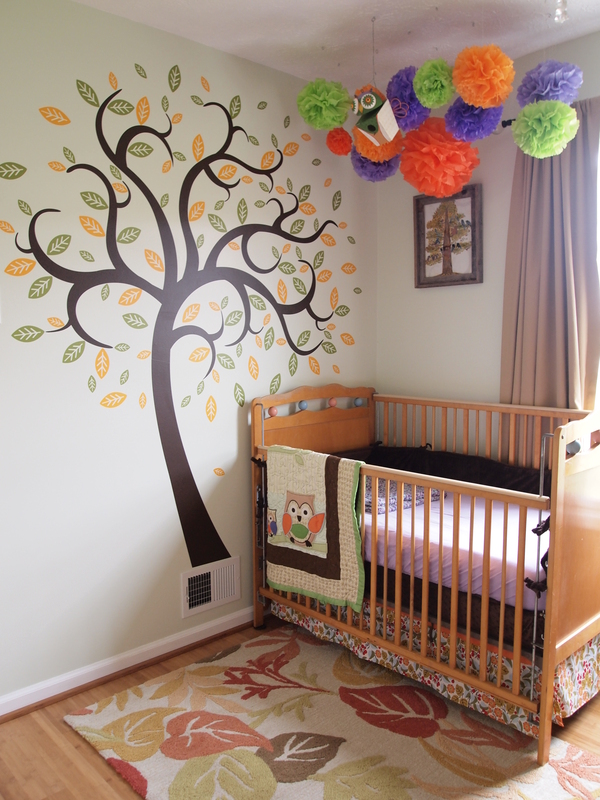 My first challenge was making a nursery theme around a book with a tragically 1970’s color scheme. You know those plates our parents registered for in the 70’s? Those burnt orange shag rugs? I mean, yes, I’m a hippie- but there is such a thing as going too far. I wanted to create something that felt organic and natural, and when we found out that we were having a girl I has the Husband-imposed restriction: Not too much pink and purple, please. Luckily for him, I don’t have a deep love for pink or purple, at least as it pertains to room decor. -natural color scheme: oranges, yellows, greens and browns. 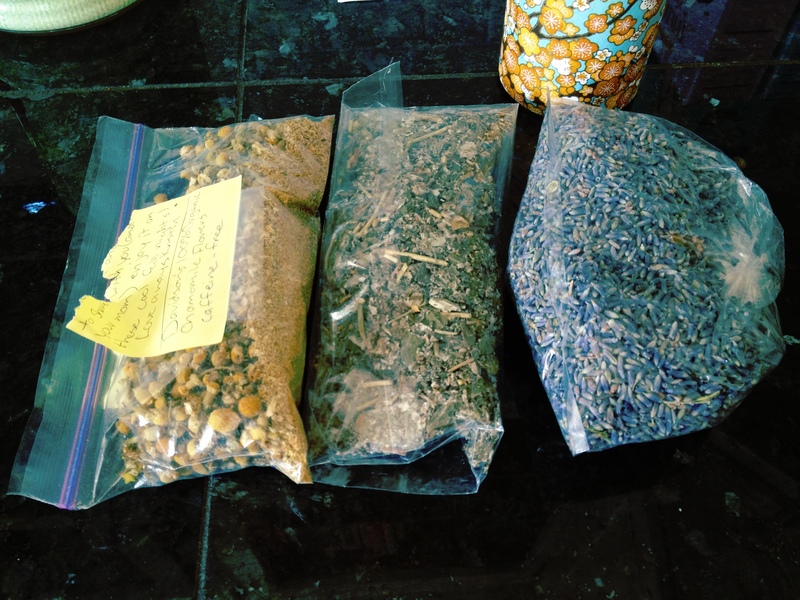 -a desire to reuse or make by hand as much as I could because it’s more cost-effective and also more eco-friendly. I finally got one of those vinyl trees (delicious). 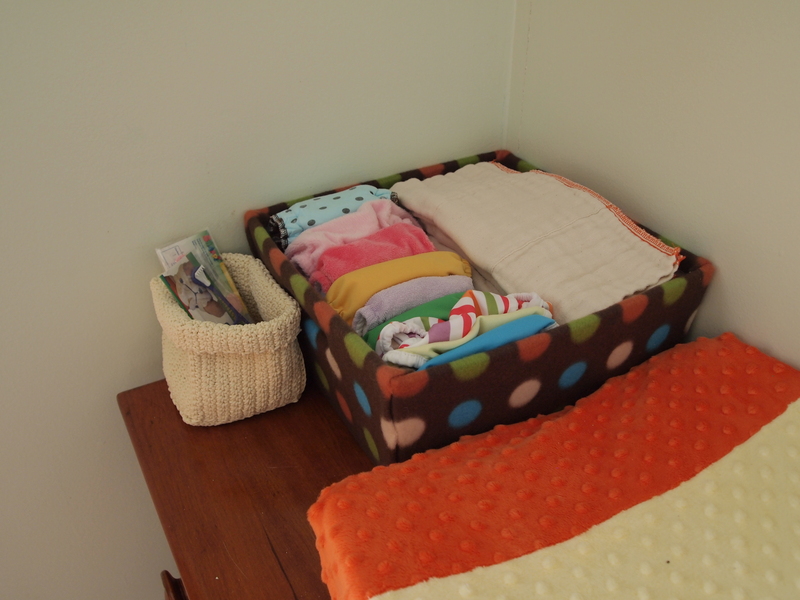 The crib is the crib that my mom, my brother and I have all slept in as babies before it was passed on to my kids. The rug is from Home Goods, I chose it over another because the colors were muted and the lines matches the lines and leaves of the tree best. 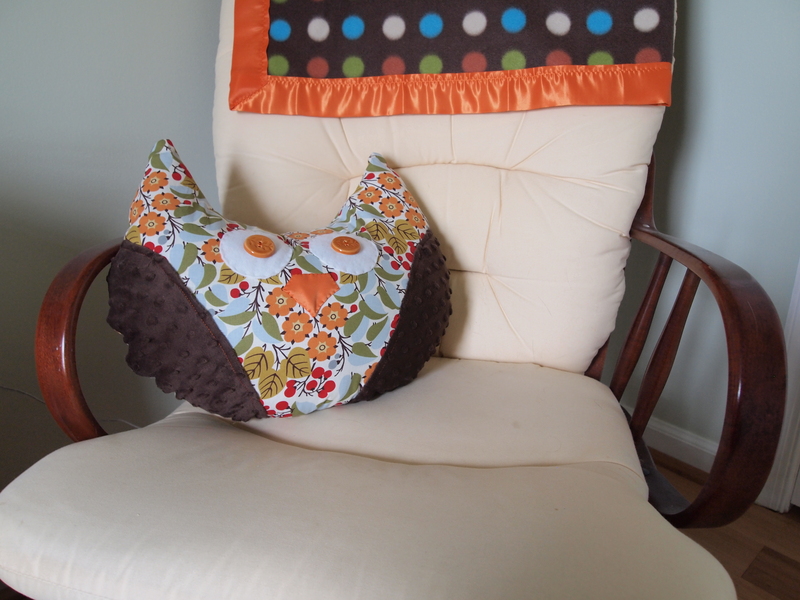 I used the same fabric to make the owl pillow and the bedskirt. I might be in love with that pattern. The dresser was my dad’s when he was a kid. 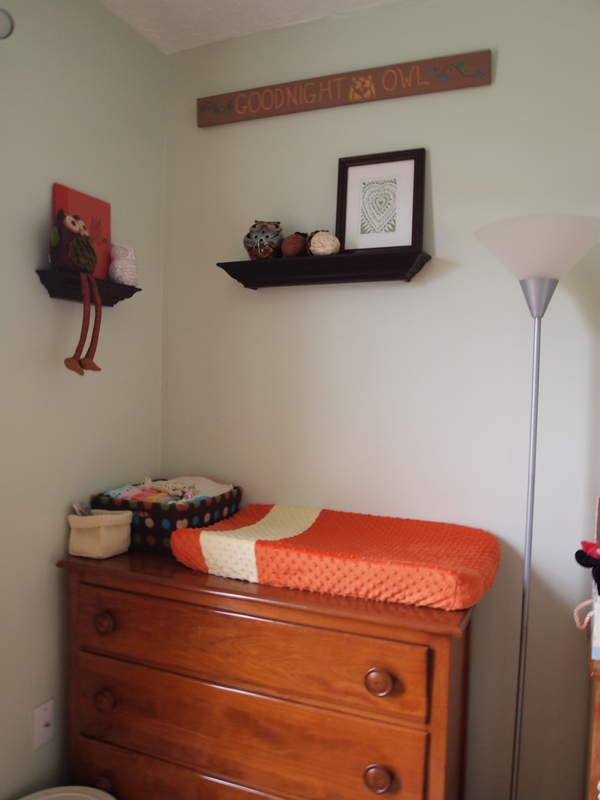 It’s just the right height for a changing table. Glider, ABC cross stitch by my Mom, owl stencil by me, owl pillow also me. The Husband scanned a page from the book and then printed it and I framed it to hang above the crib. 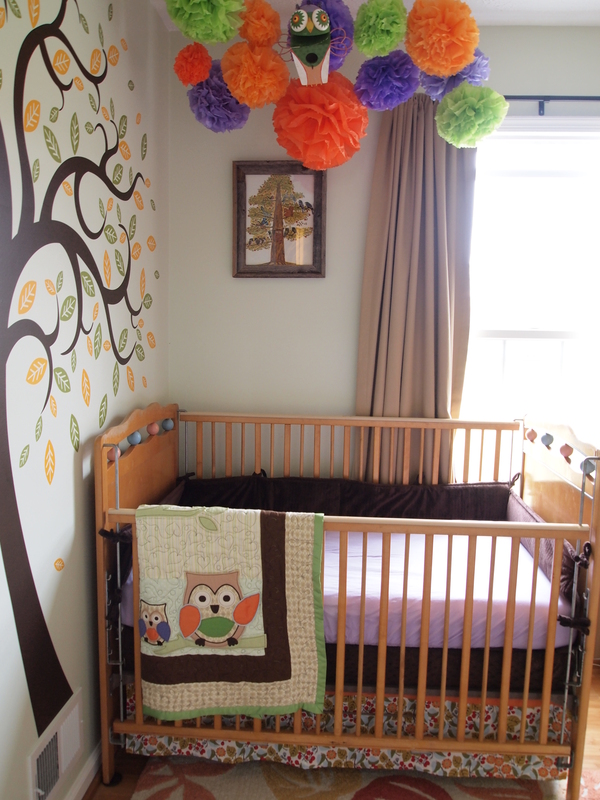 I made those famous Martha Stewart tissue pom poms as the mobile above the crib. 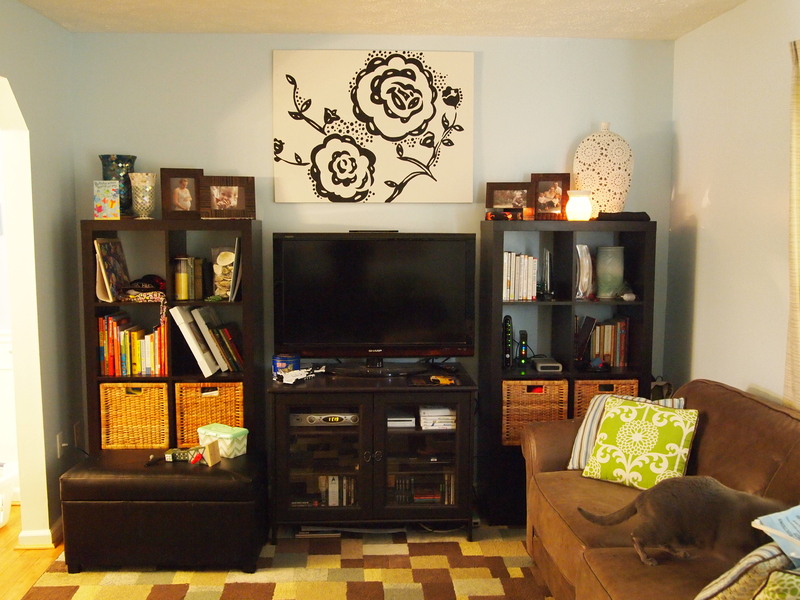 I also scored this owl at Hobby Lobby on clearance and painted it to coordinate with the colors in the room. I felt that the original magenta would not quite work with the colors in the room. Tiny fluffy diapers. Squee! 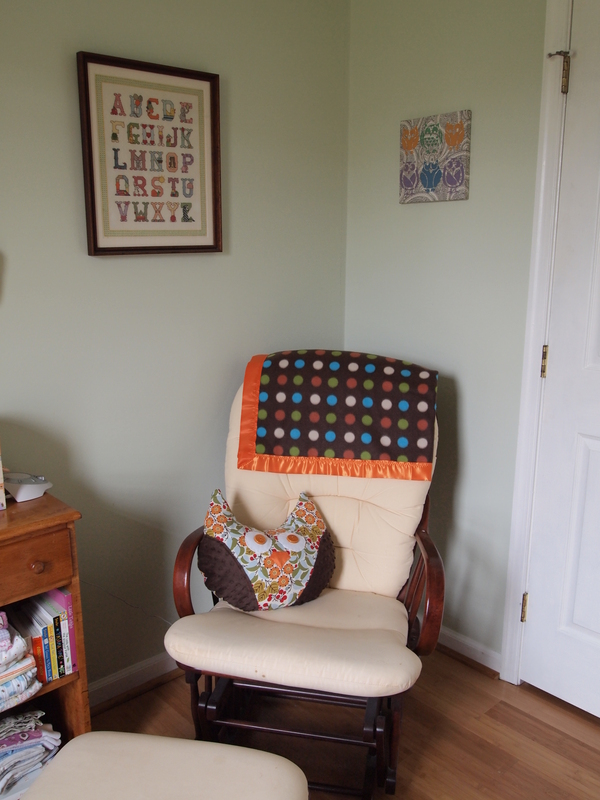 I had a storage container and took some extra fabric that matched the blanket on the back of the glider and glued it on. 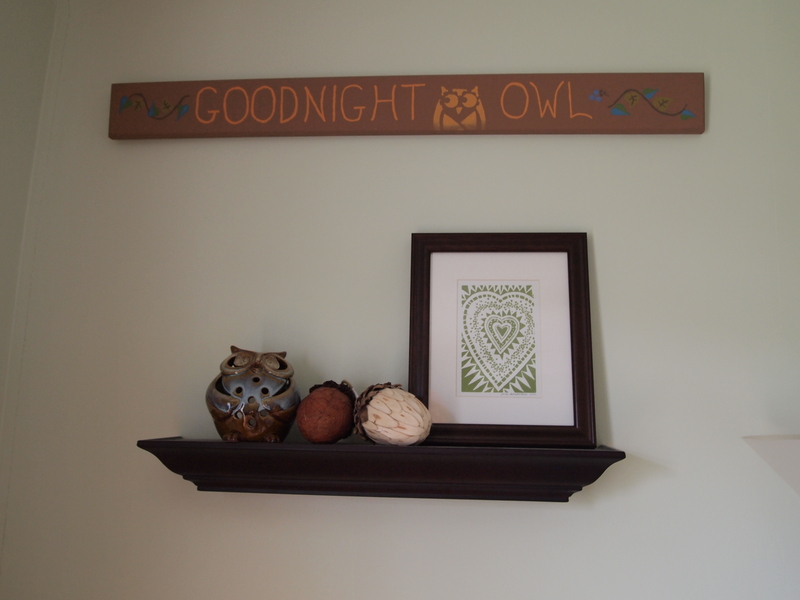 Goodnight Owl sign I made from repurposing the old “No more monkeys jumping on the bed” sign. Heart lithograph print from Etsy. Owl and acorns from Pier 1. 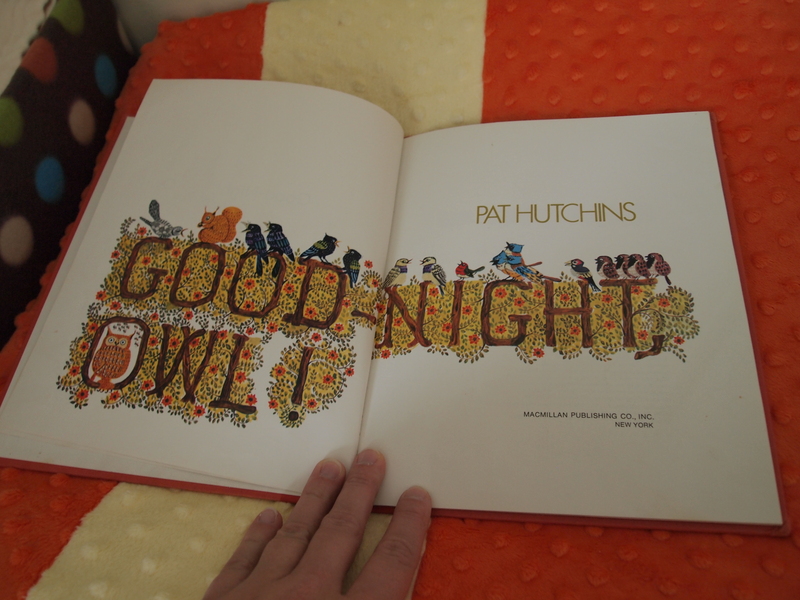 Pat Hutchins book, Goodnight Owl. The cover was ripped into a million pieces, luckily the hardcover is pretty cute too! Owls from Pier 1. We started this built-in project 6 weeks ago. My only real goal was to have it done before the baby comes. We made it! It’s done, and it’s fabulous! In order to appreciate the beauty of what’s new we have to remember where we have been. This was functional, yes. But not ideal for storage and too easy for the animals -I mean children- to climb on. It lightens the room. It’s custom to the space. 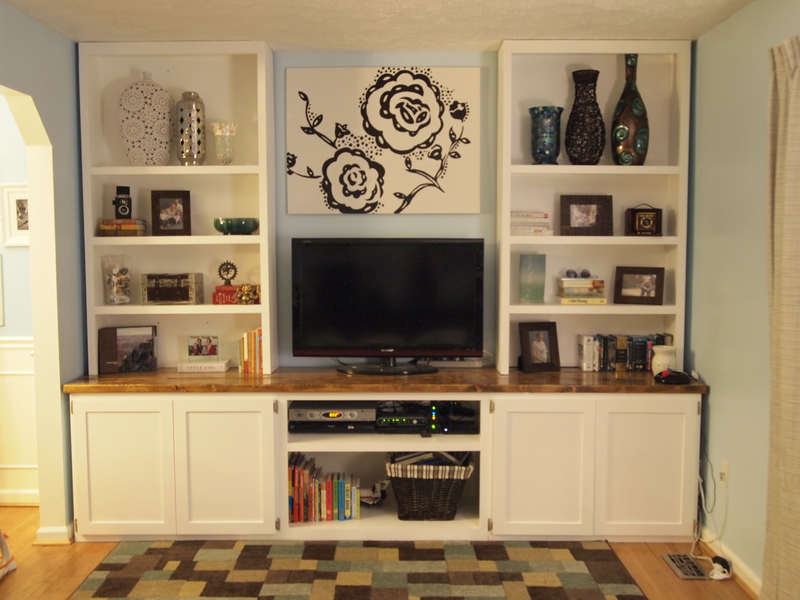 It cost about $600 in lumber and other materials (like high gloss Poly.) And after all that deliberation about cabinet door hardware I think we are going to leave the doors naked and skip the hardware completely. I am otherwise incredibly cranky and completely over being pregnant. I’m now just about 38 weeks I’m so done. I’m not that uncomfortable, I’m still physically feeling okay, but of the last 5 years of my marriage I’ve been pregnant for about 50% of the time. I’m ready to be done being pregnant. I wish I was more enlightened and could just wait for baby to come when she’s good and ready, but I’m just not that noble. I’m impatient. I want to meet her, the Boys want to meet her, and most importantly I want to be able to chase after Jack on his bike, or Henry on foot without thinking she might just fall out mid-stride. What’s a pregnancy without a little drama-rama? Apparently I am doomed to repeat pre-labor again and again. 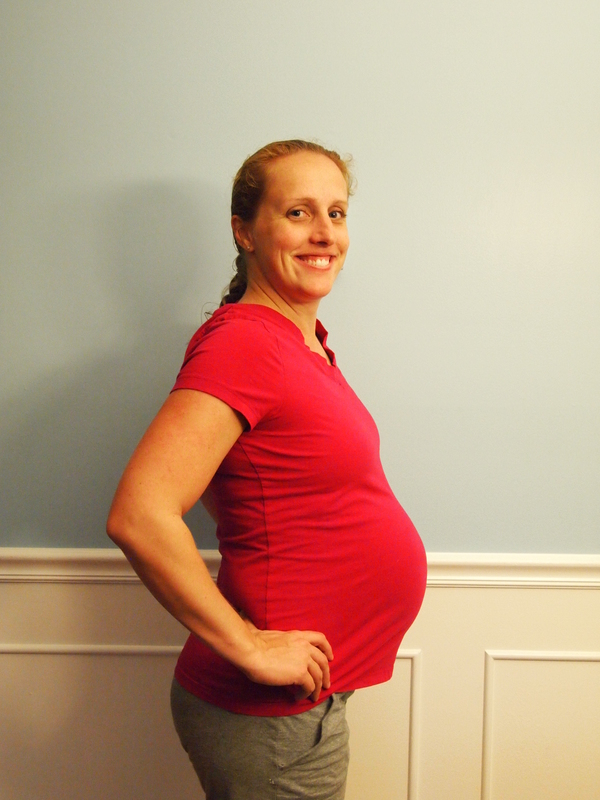 I’m now 3/3 for pregnancies that included prodromal or pre labor at the end. I’m going to have to ask that this time, real labor comes with either a neon sign or an engraved plaque indicating that this is the real deal. Two nights ago I started to lose my mucous plug. The next morning I lost some more. In the process of running errands in the morning I realized I was contracting every 5 or 10 minutes. I was feeling woozy so I did my best to take it easy and stay hydrated. During nap time I took my own nap, which was interrupted every 5 or 10 minutes by contractions. Since I was 36 weeks 4 days yesterday, not quite the magical 37, I had been in touch with the midwives all day. I was also staying in touch with my doula. By 3pm the contractions were 4 minutes apart and more painful, but still in no way debilitating but increasing intensity is something to look for. I went in to the office to confirm that the drops of fluid I felt was just more plug and not amniotic fluid. It was. I was sent home with a confirmation that this was not yet active labor- everyone, stand down- and with a prescription from my midwives to have a small glass of wine to help stop them. Midwives are awesome. As an added bonus, I was told I can now to skip this weeks regularly scheduled appointment, freeing up time in my schedule for skydiving, running, and standing on my head (okay, I am still doing that one!). Sometimes I have these brilliant ideas, but they turn out to be a disaster when I try to execute them. Other times I have an idea that may, or may not be brilliant, and manage to pull them off brilliantly. I’d like to think this is one of those times. I devised a plan to split the difference on their birthdays and throw one huge birthday bash during the time in-between. For once I didn’t angst over which people to invite or not- which is something I always do because I’m worried about the house feeling too crowded and the guests not enjoying themselves because they feel all claustrophobic. I didn’t ask Matt what he thought of the guest list, (because anymore than about 5 people is too many for him). I just invited everyone and hoped for good weather and that no-one would mind a crowded house. I feel like everything worked our really well, and I spent most of the time enjoying myself, not stressing out leading up to or during the actual event! I found invites like these on Etsy but they were too pricey for me. 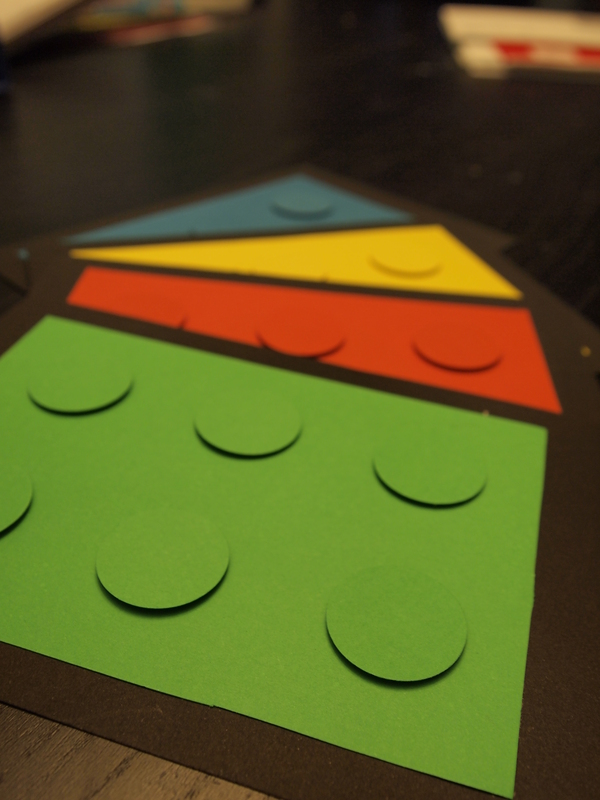 I was able to make these with cardstock, a 1″ hole punch and some double-sided 3-D tape. The candy used on the cakes is from Candy Kitchen; construction and project logistics managed by Papa. I made these with a hand-designed stencil and some fabric paint. I also used a hair-dryer, incase you were curious! I think they turned out great! 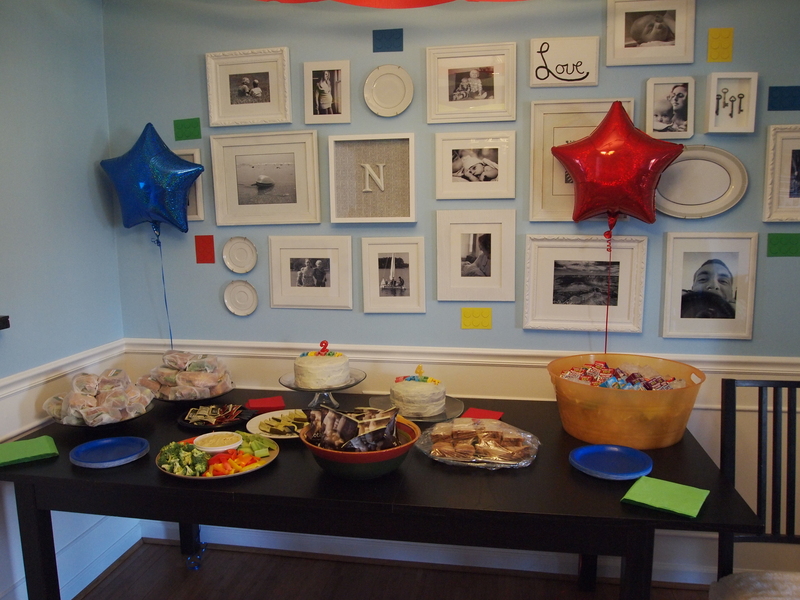 I even hung some Legos on our wall-o-photos. 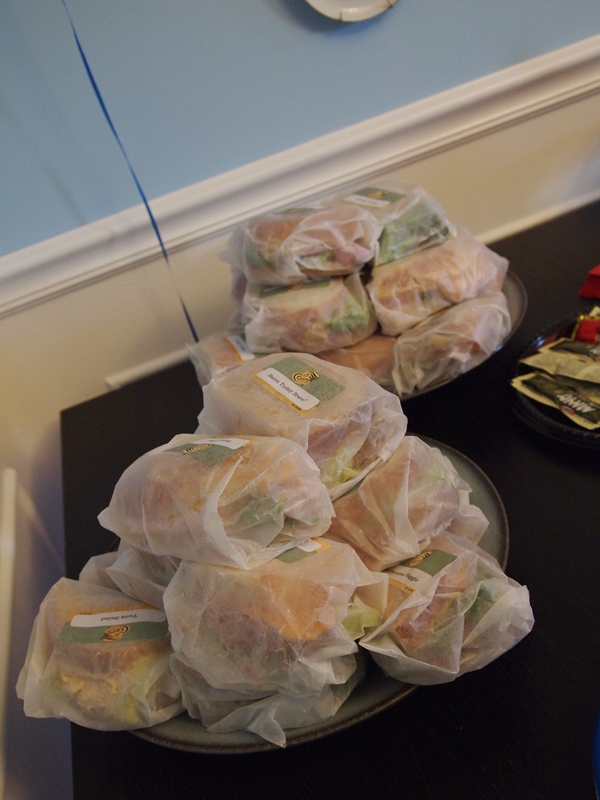 I finally got smart and ordered catering platters instead of stressing myself out with a complicated menu and many hours sweating in the kitchen- thank you, Panera! 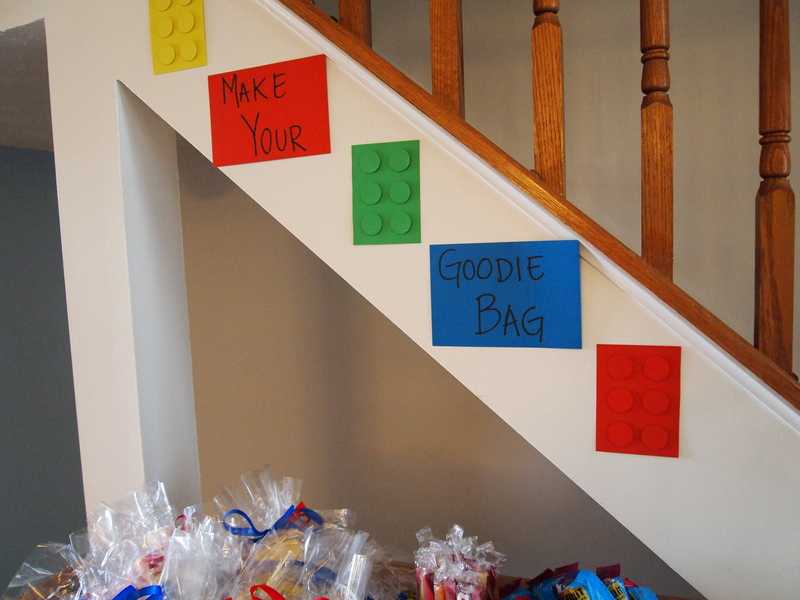 Who doesn’t love a goodie bag station? 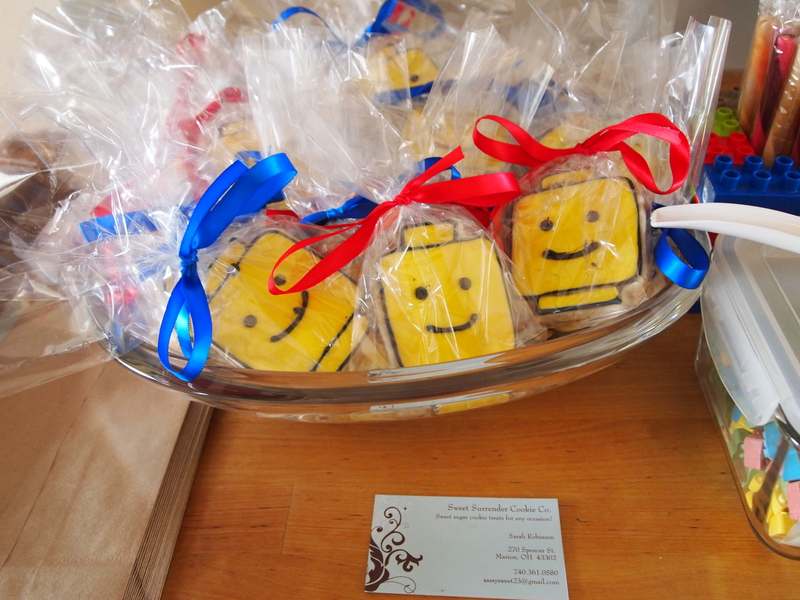 These Lego cookies were amazing! Thanks to Sweet Surrender Cookie Co. -Etsy. Not only did they look great, I can personally verify that they taste great too! 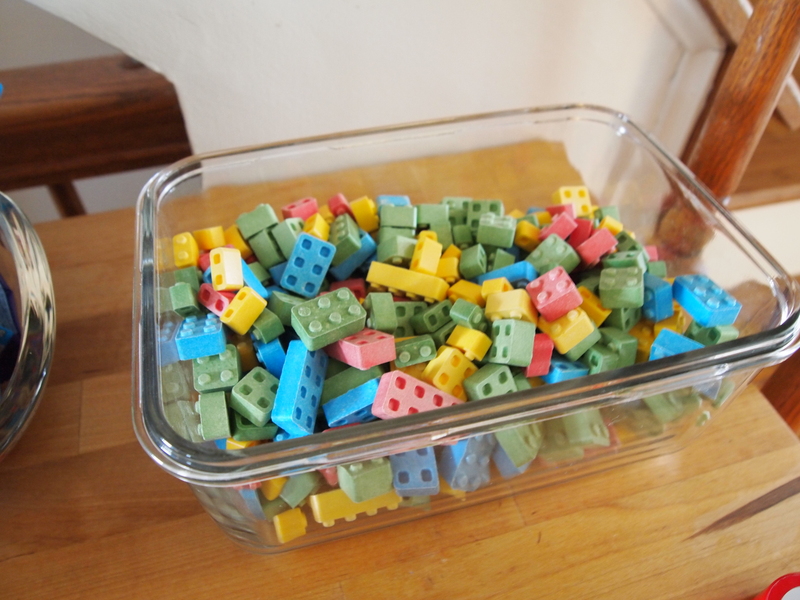 More Lego shaped candy from the Candy Kitchen. The whole event was a swinging success! 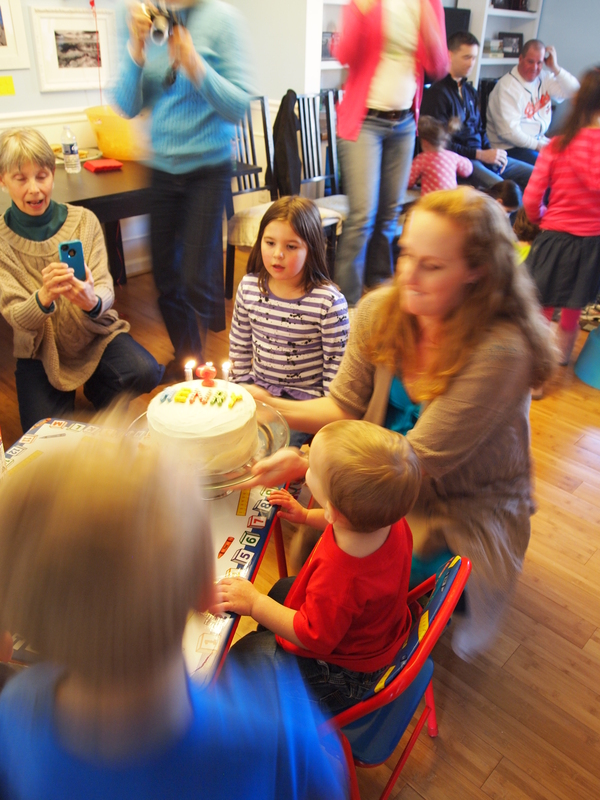 Yes, we sang ‘Happy Birthday’ twice, but I don’t think they minded sharing. 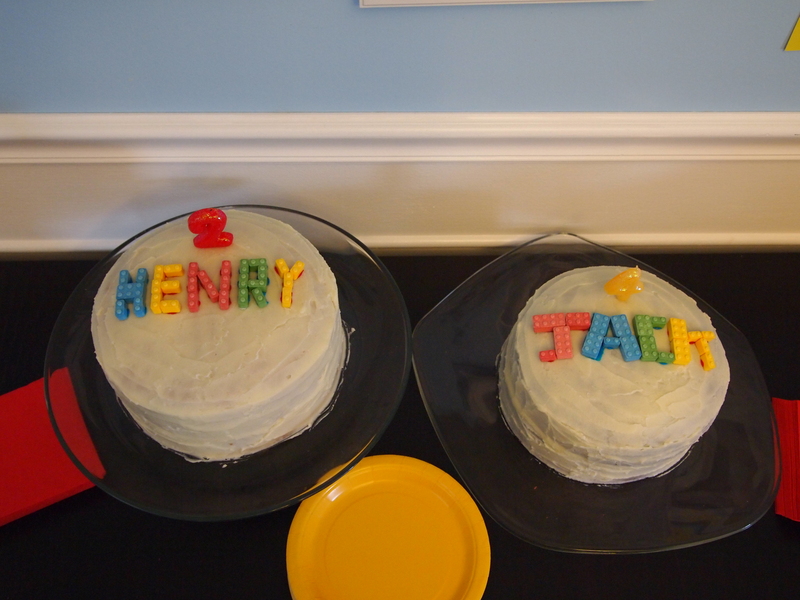 Jack particularly enjoyed telling people that he is 4 and Henry is turning 2 soon. Despite my acute awareness of being pregnant, it often escapes me that I’m going to HAVE a baby. When he told me I was 2cm and 50% effaced I was like “Really?“. And then it dawned on me. I’m actually going to labor and deliver a baby. I don’t really know why this surprises me, but it does. I could tell you 5 things I can’t wait to do with my newest baby, but that’s not what has been rolling around in my head lately. Here are 5 things I can’t wait to do after we get this baby out of me!! 2. Lay flat on my stomach. Anywhere. Even just for a second. 4. Run or jog or climb stairs without feeling like a head is about to pop out between my legs. 5. Not pee 15 times a day. Really, my wants are simple. In the grand scheme, 4 weeks (give or take) isn’t that ling to wait for these things, but right now? 4 weeks feels like eternity. I get to a point with each pregnancy, always in the last 10 weeks where I really prefer cold beverages. I’m just too hot all the time to want to pour fuel on my hormonal fire by drinking something heated. To get the benefits of red raspberry leaf tea I make an ices blend. Red raspberry is great for women’s health, especially as it helps prepare the muscles of the uterus for contracting during labor. 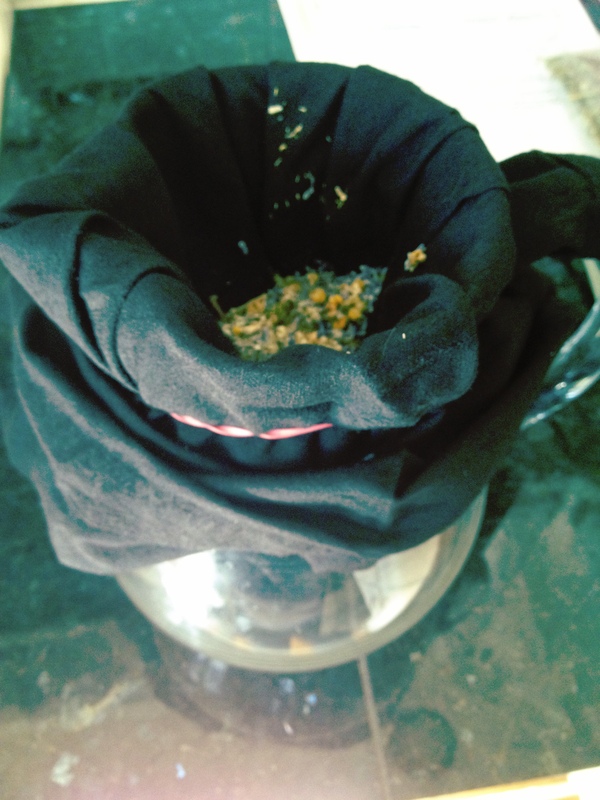 I boil water in my teapot and in a cloth napkin suspended at the top of a glass pitcher I place red raspberry leaf, chamomile, and lavender in a 2:1:1 ratio. I usually forget about it and over steep by 5 or even 10 minutes, the tea, but I always remember to add sugar or honey before it cools. I did spend 2 years in North Carolina, I know about the sweet tea!